Columbia Records’ country quintet Home Free is set to make a splash with the world premiere of their new track and music video, “Fishin’ in the Dark / Down in the Boondocks,” exclusively on USAToday.com today (8/28). The mashup combines Nitty Gritty Dirt Band’s classic #1 hit “Fishin’ in the Dark” with Platinum-selling country group Little Big Town’s contemporary “Boondocks.” The song is featured on Home Free’s third studio album, COUNTRY EVOLUTION, due out on September 18. Directed by FifGen Film’s Reilly Zamber, McKenzie Zamber and Jimmy Bates, the music video splices both thematic and vintage-looking graphics creating a visually exciting pairing of the two hits. For Home Free it is important to reach out and interact with their fans through music videos. COUNTRY EVOLUTION is now available for pre-order on iTunes, Amazon and all other major digital retailers. Fans can receive an autographed copy by pre-ordering through their website here. In the coming months, the band will embark on the 2015 DON’T IT FEEL GOOD Tour and the just-announced HOME FREE FOR THE HOLIDAYS Tour. Kicking off December 2 in Duluth, MN, Home Free will bring fan favorites and holiday jingles from FULL OF CHEER to 15-plus cities nationwide. Tickets will be available for pre-sale for members of Home Free’s Patreon community on September 8 and available to the general public September 11. Additionally, they join country icon Kenny Rogers on his first Christmas album in 17 years, ONCE AGAIN IT’S CHRISTMAS, performing “Children, Go Where I Send Thee” (Warner Bros./Warner Music Nashville, 9/25). Since being crowned NBC’s “The Sing-Off” victors, Home Free has made their mark on the music scene selling more than 150,000 copies combined of their popular albums, CRAZY LIFE and FULL OF CHEER, embarking on two major national tours and amassing nearly 40 million YouTube views. The five-man band from Minnesota, comprised of Austin Brown (high tenor), Tim Foust (bass), Rob Lundquist (tenor), Adam Rupp (vocal percussion/beat boxer) and Chris Rupp (baritone), dropped their debut album CRAZY LIFE in 2014, which hit #1 on iTunes Country and #4 overall. Founded by brothers Chris and Adam Rupp during their college years, Home Free has been perfecting their live show for nearly a decade performing together for packed crowds at major fairs, colleges and theatres. Their experiences on the road helped carry them to the Sing-Off victory, build a loyal fan base and bring their homegrown country style into the national spotlight. 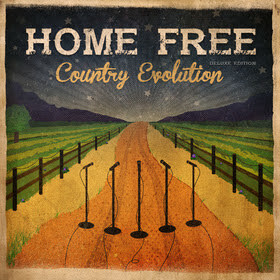 For tour dates and more information on Home Free, visit http://homefreemusic.com/.